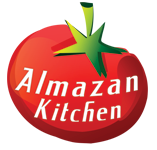 Awesome stuffed courgettes with free-range premium beef, organic fresh greens, fresh homemade mozzarella and outstanding homemade wine, everything cooked with a notch of AlmazanKitchen passion! Do not forget to check the video and try out the recipe! Slice and chop 400g of free-range premium beef well! Cut in half organic courgettes, scoop out the seeds. Toss 1 tsp. of cumin seeds into the pan along with onions and beef. Cook until meat is brown and onions are crispy golden. Salt & pepper halfway. Pour in 1 cup of homemade wine, stir well. Add 1 tbsp. of homemade butter, let it melt. Add ½ cup of rice, stir well and cook till ready. Grease the clayware casserole with oil well. Stuff the courgettes with filling. Place it into the casserole. Put few stick of fresh basil into the casserole. Cut organic tomatoes in half and put it into the casserole. Fresh homemade mozzarella time, put it into the casserole. Cover with lid and slow cook on fire for 30-40 min. Finish off with chopped fresh chives and….